We're based in Austin, Texas and when founder Carina Menzies became inspired by the pursuit of sourcing the purest form of natural ingredients from around the globe. A label-fanatic at heart, Carina realized that many of her favorite beauty products had ingredients that were less than desirable. After working for a few major cosmetic lines and discovering that they would never offer the simple, natural products that she and many other women were looking for, Everyday Minerals was born. Carina set out on her own path to create something of substance and goodness that women around the world could enjoy. All of our products are 100% vegan, sustainable, and cruelty free. Handmade right here in Austin, our eco-friendly and recyclable packaging stays true to our commitment of preserving the natural beauty of the world and each other. Everyday Minerals is a comfortable place where it's easy to find a variety of makeup shades, all perfect for your unique skin tone. We offer trial kits and free samples galore - your choice, all the time. Our award-winning base shades, perfectly pigmented eye and cheek colors, and revolutionary concealers and finishing powders are designed with you in mind. This is how Everyday Minerals works: we offer 7 free samples anytime, no purchase necessary. Just pay for shipping! It only makes sense to try before you buy, as colors can be very personal. In addition to helping our customers find individualized shades, we also offer custom kits that come with free gifts and special offers. These carefully curated kits come in an array of themes and colors to keep your makeup wardrobe fresh with the seasons. We cater to women looking for high quality, creative makeup at an affordable price. Our accessibility to everyone is paramount! At Everyday Minerals, you'll find the innovative, fresh and modern products that we're known for, with the convenience of online shopping. In a different country? No problem! We likely ship there, too. Everyday Minerals is proud to give you a behind-the-scenes peek at some of our favorite industry tips and tricks, thanks to our expert makeup artists that contribute on our blogs and videos. Finding a new makeup technique, or perfecting an old one is now easy. Our ingredients really make our products stand out. Each product has been carefully and thoughtfully created with real botanicals and pure minerals. We love creating and playing with ingredients, and dreaming up beautiful new recipes! Our products aim to create a lively, energized take on familiar products, which result in shades and items that are sophisticated, effortless and modern. At Everyday Minerals, we're constantly evolving as new ideas blossom, and invite you to join us on this naturally beautiful journey! Everyday Minerals Finishing Dust works great to set your makeup and rid your skin of excess shine. I love that this finishing dust feels light and natural on my skin. Even better, is that it looks natural on my skin. It blends in perfectly and looks absolutely fabulous. I also love that Everyday Minerals Finishing Dust is created with real botanicals and pure minerals. This is a great product for everyday use! A wearable cool tone that illuminates with white shimmer effects. Everyday Minerals Hint All Over Shimmer Looks absolutely fabulous on my skin! It's made with real botanicals and pure minerals so it looks and feels completely natural on the skin.The white shimmer effect really gives your skin a beautiful healthy glow. Everyday Minerals Hint All Over Shimmer is great for everyday use and really makes your skin look bright and healthy. Earthy brown with shimmer to brighten the complexion, ideal for day or night looks. Everyday Minerals Sunny All Over Shimmer is amazing! I love that this shimmer has an earthy brown tint to help give my fair skin a little color. I also love that it brightens my complexion and leaves skin looking healthy. 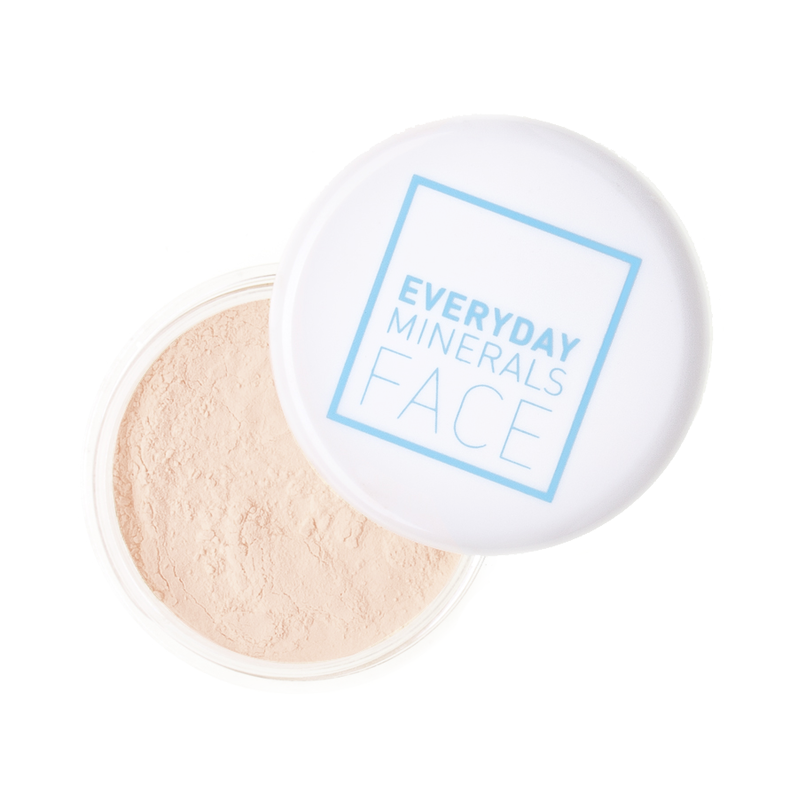 Everyday Minerals Sunny All Over Shimmer is made with real botanicals and pure minerals and is great for ever day use. It looks completely natural on the skin and doesn't feel heavy at all. I love wearing this everyday to give my skin a healthy looking glow. Just like our other Kabuki brushes, the design of this brush is based on those used to apply makeup for traditional Japanese kabuki performances. Its longer handle allows for more dexterity when applying both face powders and blushes. Its rounded top is great for grabbing onto pigment, so tapping out excess powder before application is a must depending on the intensity of color you would like! 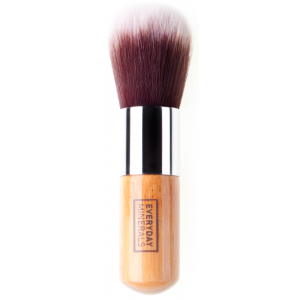 Everyday Minerals Long Handled Kabuki brush is perfect for applying all your powders! I love that the brush bristles are dense and plush allowing you to really focus in on the area your working on blending. It works great to blend in all your powders and blushes and leaves skin looking flawless. 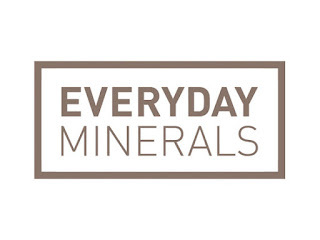 Follow Everday Minerals on social media!